Purell hand sanitizers have earned their reputation as the best in the game. With 99.9% of all germs destroyed on contact, don't make the error of opting for less effective discount hand sanitizers. When you're in an environment that goes through many bottles of Purell hand sanitizers, you can save yourself some money by opting instead for this economy sized bottle of Purell. Other hand sanitizer brands just end up costing you more for a less effective product. If you would rather keep one large bottle on hand rather than having to juggle Purell refills and constantly having to monitor dispenser levels, than purchasing this 2 liter bottle is the best idea for you. 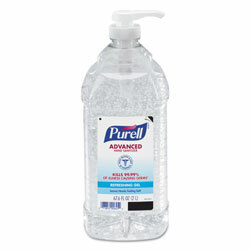 You can get this 2 liter bottle of Purell at prices that would normally be reserved only for discount hand sanitizers when you shop at ReStockIt.com. If you already have a dispenser system in place, you can also get all varieties of Purell refills when you shop at ReStockIt.com. INNER PACKAGING: 1 Bottle. 2 Liters per Bottle. Liter - 2 Hand Sanitizers from Purell! 2543 In Stock today. Great product. We have survived flu season with minimal illness among the staff. Hurray! Was shipped inside plastic bag and had leaked out some fluid.